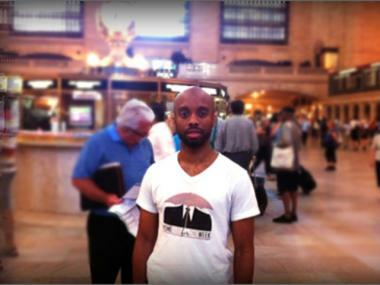 Yusef Ramelize will spend a week living in and around Grand Central Terminal to raise money and awareness. MIDTOWN — A graphic designer plans to spend a week living and sleeping in and around Grand Central Terminal in a bid to raise money and awareness about homelessness in the city. Queens resident Yusef Ramelize, 34, plans to move into the landmark building around the corner from his office on Aug 21. for a seven-day stay in what he has dubbed his annual "Homeless for One Week” campaign. The idea began to be formed three years ago when Ramelize spent a week living in the subway system and sleeping on trains during a winter freeze. “With the recession, I just felt like homelessness in New York City was growing and there were so many misconceptions about them,” said Ramelize this week, sitting in the building that he’ll soon be calling home. With so many big corporations cutting back on their non-profit giving, he said the role for private citizens had also grown. “It’s kind of our turn to step up," he said. Last year Ramelize was able to raise $5,000 through donations for The Food Bank of New York during a week living on the streets near Union Square. This year he’s aiming to raise $5,000 for Brooklyn non-profit CAMBA by camping out at Grand Central. “Hundreds of people go through here [every day] and so many don’t realize how many homeless people make their homes here,” he said of the choice. Ramelize said he plans to spend the duration of his stay wandering the streets. He won't return home, go to work or change his clothes, and will carry no cash or electronics except for a small digital camera to document his journey. He also plans to spend the week without shoes, wearing plastic bags on his feet instead. Despite the harsh physical conditions, Ramelize said spending a week without his cell phone is by far the hardest part. Because the stay will coincide with Ramadan, Ramelize, who is Muslim, plans to break his fast each night with a meal at a nearby mosque, which offers free food for the needy through the month. He sees the annual experience as part of his Ramadan sacrifice. “This is my spiritual journey to inspire other people to make their own personal journeys,” he said. But Ramelize might run into some problems, said Marjorie Anders, a spokeswoman for the MTA, who said the homeless are not allowed to live in the space. Grand Central Terminal closes each night from 2 a.m. to 5 a.m. and the subway, commuter railroad terminals and stations are not safe, she said. In addition, the terminal is regularly patrolled by MTA/Connections Outreach workers, who steer the homeless away from MTA property, she said. Ramelize said he plans to sleep near the station if he's booted, but has never had a problem with police or security officers during past periods of homelessness. He also said that, despite some fears, he’s never had an incident involving the homeless men and women with whom he's shared the street. Last year, he said he was “petrified” after having heard the homeless in Union Square Park were territorial about where they slept, but was amazed with what he found. Still, he said he shies away from discussing his project with the men and women he meets. “It’s hard for some people living this reality everyday to appreciate what I’m doing if I’m only going to do it for a week,” he said. Ramelize said that in addition to drawing attention to the growing number of homeless in the city, he hopes his project will help change the negative view many have of people living on the street. “For some reason there’s just a disconnect. It’s almost like they don’t even exist," he said. "There’s no compassion or love for the people that sit next to you on the bus everyday."